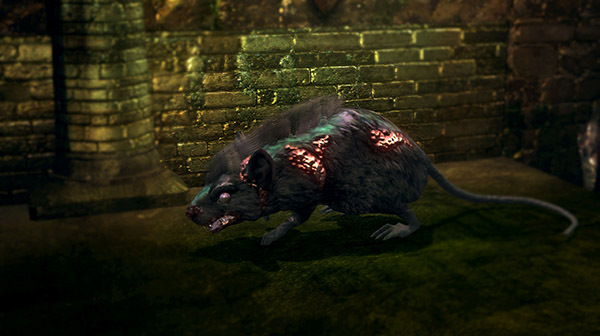 Undead rat with festering open wounds and poisonous attacks. Even though it's the smallest of its kin, it's still the size of a dog. Not very strong, but often appear in groups, so be careful and bring poison resistance equipments. One is located inside the aqueduct tunnel connecting the Firelink Shrine to the Undead Burg. There are three in the room with the ladder underneath the Hellkite Dragon bridge. Found in various locations throughout the level. A few are hiding in boxes and will ambush the player. Biting attack - Basic attack, swinging its head against the player. Poison buildup on hit. Standing attack - Will get up on it's back-feet and kinda drop down with it's paws. Poison buildup on hit. 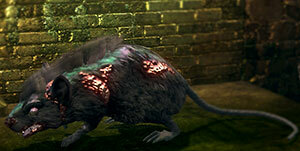 Don't get surrounded by these rats as even if you block its attacks, it still builds up poison. Block safely using 100% poison resistance shields such as Spider Shield, Crystal Shield, or Greatshield of Artorias.